What if the managing director of a privately held, multi-billion dollar company – following extraordinary vision and strategic leadership over a five year period that led to significant business growth and expansion – was offered, and ultimately accepted, a new challenge to lead another organisation in another country? Do you think the business would have identified, tested and adequately developed one, if not many potential successors to step into the top leadership role without missing a growth target? What if two out of five key members of the senior leadership team (SLT) left a thriving small business as part of an acquisition deal that brought in lots of cash for intellectual property and an operating business unit, but the remaining leaders were out of their depth without the stability, familiarity and institutional knowledge of the entire SLT? Do you think the leadership team would have developed a talent pool from which to elevate business-critical SLT members during the 12 month transition period? What if this isn’t a game and these are examples of real-world scenarios in which both companies were ill-prepared to change in general and in particular, manage succession risk? What if these examples broadly describe the succession dilemma you’re in right now? 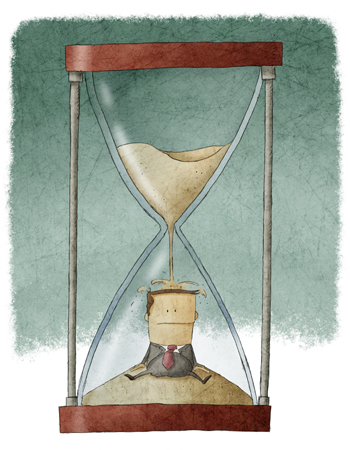 All too often, succession is put into the too hard pile – deemed too uncomfortable to discuss with senior leaders who don’t have time to talk about the future knocking at their door; too risky to discuss with potential successors for fear they may use their high performing successor label and accompanying flattery to stop working hard, or the head man or woman in charge is not too ready to consider a successor for themselves and instead sheepishly, unwilling to manage the inevitable. While there is no single silver bullet to managing succession, generally speaking, the 80-20 rule applies; 80 per cent of succession should preferably come from within the organisation as home grown talent while 20 per cent of best-in-class talent is brought in from outside the organisation to ensure a healthy mix and churn – especially in business-critical roles. At the other end of the succession pipeline, most are likely to come from best-in-class entry from the external market as a means of building a robust talent pool that establishes a succession pipeline – a group of key talent to be developed as core bench strength for the future. At either end of the pipeline, managed as a realistic business risk, succession – by way of the known, unknown, expected or unexpected – is to be managed as diligently as profit and loss, cash flow or health and safety. Organisations of all sizes, shapes and complexities are either prepared to manage risk or they are caught flat-footed in a competitive environment in which continuous change is likely to be business as usual, not the exception. The difference between organisations that manage succession risk and thrive in the midst of continuous change and those that fold under its pressure is managements’ ownership, due diligence and responsibility for identifying the criticality of roles, harnessing change to test, learn, assess and make succession talent pool decisions, and planning and committing to succession readiness for the immediate, short and long term. • Planning for now, committing to next and after. The first risk management requirement is identifying business critical roles. Business-critical roles are close to or at the pinch point of change that drives markets, customers, technology and innovation. Further, business-critical roles have a high degree of performance variability such that there is likely a significant business performance difference or outcomes between high and low performers. The profile of business critical roles has three main objectively assessed components: capability – a forward-focused balance of technical expertise, specialist know-how, broad-based commercial acumen and management skills; credibility – established and validated legitimacy through demonstrated knowledge and experience across known and unknown stakeholder groups within and outside the organisation; and courage – a brave, tactful and resolute approach to adversity or challenging circumstances without fear or intimidation. The second risk management requirement is leveraging change – projects, initiatives and programs – that are relatively fixed in length and scale, well-defined in both structure and stakeholder management, to test and learn for entry into the talent pool or succession pipeline, as well as a key decision point for senior leaders to assess potential and make succession recommendations. It is important to note these suggested change projects, initiatives and programs are not simulations. Instead, they represent optimal, real-time change opportunities to test and learn potential successors. The third risk management requirement is planning for succession readiness now – immediate succession within 6 months, committing to ready next – short-term succession readiness from 18 to 36 months, and ready after next – long term succession readiness from four to five years. Even in the most well prepared succession circumstances, the unknown and unexpected can quickly turn away from the known and expected. Therefore, preparing for ready now succession is the most immediate strategic focus – especially for business critical roles. • Ready Now can assume a role from their current position and be capable to move immediately or within the next six months. Consideration should include the balance between pushing individuals too soon within a home grown framework against the time and effort it would take to execute an external search for the role. For example, if an individual makes the short list for the role and an external search could take up to six months, then the individual could be considered Ready Now. • From an operational execution perspective, Ready Now can be released from their current role (i.e. successor identified, stable business unit, mitigation strategies in place specific to involvement in and responsibility for critical pieces of work). • Ready Next can assume a role from one job away or simply requires more time in current role to be Ready Now. 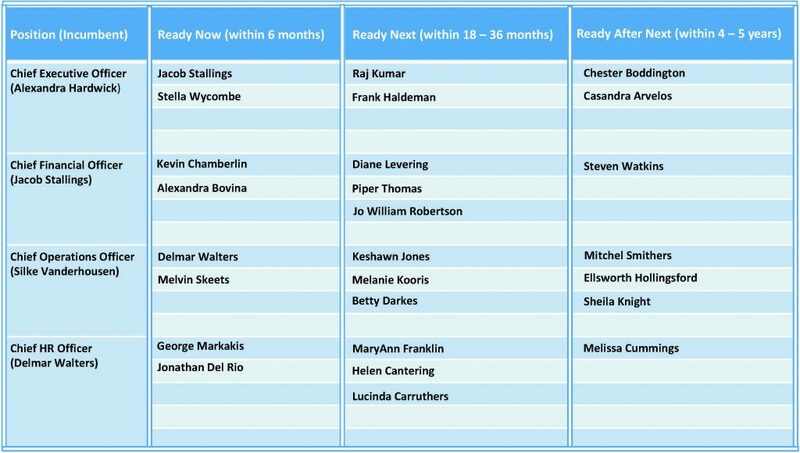 Ready Next should be capable of assuming a role within the next 18 to 36 months. • Specify the ideal next role, amount of time needed in current role and development required to assume Ready Next role in the succession plan. • Ready After Next is part of the talent pool and long term readiness planning, and can assume a Ready Next role from two jobs away requiring significant development in current and next role(s) prior to succession within four to five years. • Specify multiple career pathway options, amount of time and key experiences in current and next role(s) required to assume Ready Next role in the succession plan. What if managing succession risk was thought to be just another part of managing change? Would management take on the responsibility of identifying business critical roles to make certain the right capability, credibility and courage was engaged at the forefront of markets, customers, technology and innovation? Would leaders be willing to leverage existing change as a real-time opportunity to test and learn potential successors? Would the senior leadership team take responsibility for planning successors that are ready now and committing to developing the next successors and the ones after that? Only the change in the future will determine how well we managed succession risk today. 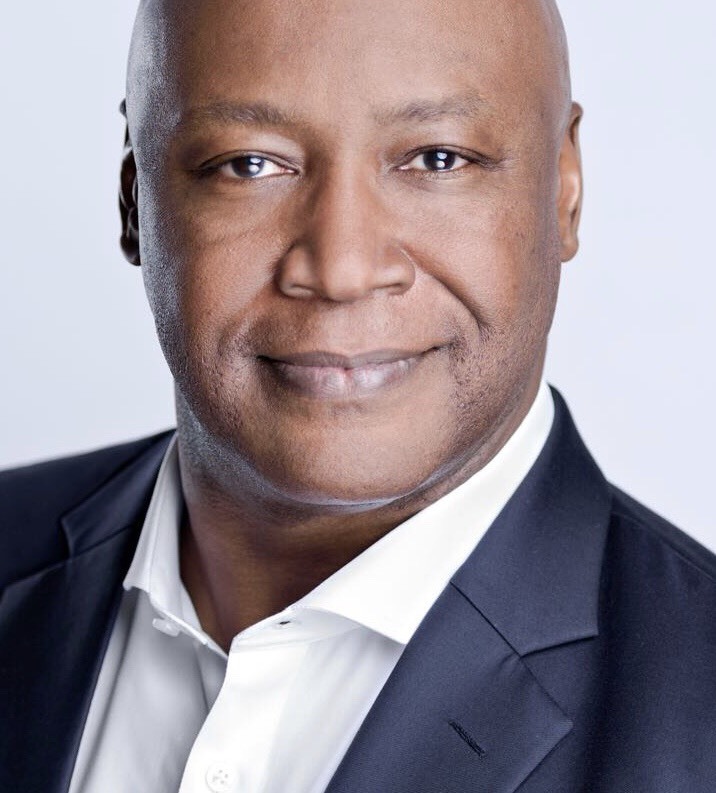 Dr Wesley Payne McClendon is a global HR executive, thought leader and executive director at McClendon Research Group, Inc (MRG). Wes can be reached by e-mail at wpm@nullmrg-inc.org, on Twitter @BLKDOC or #AskDrWes. Wes’ book, Strategy, People and Performance, is available in Australia at Amazon, Bookworld, HolisticPage, Booktopia and EmporiumBooks.